Our Squeek is a feral cat ... I'd like to say "was" but she's still not always comfortable even around us after living with us for 8 years. When the weather isn't freezing, she spends her days on the screened porch. We've converted her from an outdoor feral (get how-to ideas) to an indoor kitty and the screened porch was a wonderful asset. She lived in the woods as a feral, so it's nice that she gets to see many of the animals she knew with the safety of the screen. We have raccoons, skunks, opossums, rabbits, deer, squirrels and all kinds of birds so she is well entertained. With a feeder right in front of the porch, all the wildlife come to see what's available each night. I also toss our veggie and fruit scraps nearby. The only thing missing is the ground beneath her feet and the freedom to wander where she chooses. I can provide the earth and leaves and some of the scents she'd have exploring the woods by making up a 'woodsy box' for her to lie in. Then she can dream that she's wandering through the woods while she cat naps. She loves it! My neighbor had a lid to a holiday sheet cake container so I filled it halfway with dirt and added some leaves I scooped up from the woods and put in a couple of small fallen logs. 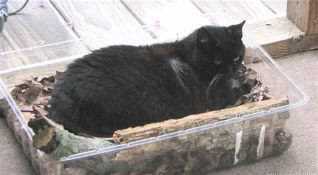 You can use a litter box like I did last year or any container about that size. I like to swap out the contents every year to make it different for her. Last year's box had one of her favorite grasses.